The Belgian symbolist Fernand Khnopff (1858-1921) is one of my favourite artists; Caresses (1896) is one of his most famous paintings. I like it a lot, though I find it more interesting than attractive. It’s a good example of Khnopff’s art in that the symbols are detached from clear meaning and float mysteriously in a world of their own. As Khnopff used to say: On n’a que soi – “One has only oneself.” But he was clearly inspired by the story of Oedipus and the Sphinx, which is thousands of years old. Indeed, an alternate title for the painting is The Sphinx. It must have been a large disaster. Perhaps cheetahs barely survived the inferno of a strike by a giant meteor, which would make them a cat out of hell. In 1896, they became a cat out of Bel too when Khnopff unveiled Caresses. Back then, biologists could not analyse DNA and discover the ancient history of a species like that. So how did Khnopff know the cheetah would add extra symbolism to his painting? Presumably he didn’t, though he must have recognized the cheetah as unique in other ways. All the same, I like to think that perhaps he had extra-rational access to scientific knowledge from the future. As he dove into the subconscious, Khnopff used symbols like weights to drag himself and his art deeper and darker. So perhaps far down, in the mysterious black, where time and space lose their meaning, he encountered a current of telepathy bearing the news of the cheetah’s incestuous nature. And that’s why he chose to give his sphinx-sister a cheetah’s body. How many ways are there to die? The answer is actually five, if by “die” you mean “roll a die” and by “rolled die” you mean “Platonic polyhedron”. The Platonic polyhedra are the solid shapes in which each polygonal face and each vertex (meeting-point of the edges) are the same. There are surprisingly few. Search as long and as far as you like: you’ll find only five of them in this or any other universe. The standard cubic die is the most familiar: each of its six faces is square and each of its eight vertices is the meeting-point of three edges. The other four Platonic polyhedra are the tetrahedron, with four triangular faces and four vertices; the octahedron, with eight triangular faces and six vertices; the dodecahedron, with twelve pentagonal faces and twenty vertices; and the icosahedron, with twenty triangular faces and twelve vertices. Note the symmetries of face- and vertex-number: the dodecahedron can be created inside the icosahedron, and vice versa. Similarly, the cube, or hexahedron, can be created inside the octahedron, and vice versa. The tetrahedron is self-spawning and pairs itself. Plato wrote about these shapes in his Timaeus (c. 360 B.C.) and based a mathemystical cosmology on them, which is why they are called the Platonic polyhedra. They make good dice because they have no preferred way to fall: each face has the same relationship with the other faces and the centre of gravity, so no face is likelier to land uppermost. Or downmost, in the case of the tetrahedron, which is why it is the basis of the caltrop. This is a spiked weapon, used for many centuries, that always lands with a sharp point pointing upwards, ready to wound the feet of men and horses or damage tyres and tracks. The other four Platonic polyhedra don’t have a particular role in warfare, as far as I know, but all five might have a role in jurisprudence and might raise an interesting question about probability. Suppose, in some strange Tycholatric, or fortune-worshipping, nation, that one face of each Platonic die represents death. A criminal convicted of a serious offence has to choose one of the five dice. The die is then rolled f times, or as many times as it has faces. If the death-face is rolled, the criminal is executed; if not, he is imprisoned for life. But there are f faces on each polyhedron, so the odds of rolling any face f times are 1/f ^(f-1). On average, of every sixty-four (256/4) criminals who choose to roll the tetrahedron, one will roll the same face four times and be reprieved. If a hundred criminals face the death-penalty each year and all choose to roll the tetrahedron, one criminal will be reprieved roughly every eight months. But if all criminals choose to roll the icosahedron and they have been rolling since the Big Bang, just under fourteen billion years ago, it is very, very, very unlikely that any have yet been reprieved. Suppose there is a 99% accurate test for a medical condition – say a symptomless infection. You take the test and get a positive result. What are your chances of having the infection? The x-axis represents infection rate per 10,000 of the population, the y-axis represents one’s chance of being infected, from 0%, for no chance, to 100%, for complete certainty. The coloured curves represent tests of different accuracy: 1% accurate, for the bottom curve, and 99% accurate, for the uppermost curve. The curves between the two represent tests of 10% to 90% accuracy. Note how the curves mirror each other: the 99% accurate test rises towards certainty very quickly, but takes a long time to finally get there. The 1% accurate test stays near complete uncertainty for a long time, then finally rises rapidly towards certainty. In other words, a positive result on a 99% accurate test is equivalent to a negative result on a 1% accurate test, and vice versa. Ditto for the 90% and 10% accurate tests, and so on. But a positive (or negative) result on a 50% accurate test is useless, because it never tells you anything new: your chance of being infected, given a positive result, is the same as the rate of infection in the population. And when exactly half the population is infected, your chance of being infected, given a positive result, is the same as the accuracy of the test, whether it’s 1%, 50%, or 99%. We’ve seen that we have to take false positives into account, but what about false negatives? Suppose that the rate of infection is 1 in 100 and the accuracy of the test is 99%. If the population is 10,000, then 100 people will have the disease and 9,900 will not. If the population is tested, on average 100 x 99% = 99 of the infected people will get an accurate positive result and 100 x 1% = 1 will get an inaccurate negative result, i.e., a false negative. Similarly, 9,900 x 1% = 99 of the non-infected people will get a false positive. So there will be 99 + 99 = 198 positive results, of which 99 are accurate. 99/198 = 1/2 = 50%. I was surprised to learn that vampire squid can be prey, but in fact their scientific name – Vampyroteuthis infernalis – is almost as big as they are: “for those imagining that vampire squid are monsters of the deep, they are tiny – only up to 5 in. (13 cm) long” (ibid., pg. 162). Even less-studied, even deeper-living, and even longer-named is Vulcanoctopus hydrothermalis, the “specialized deep-sea vent octopus”, which is “found, as its name suggests, near deep-sea hydrothermal vents way down at 6000 ft. (2000 m)” (“Introduction: Meet the Octopus”, pg. 15). Life around hydrothermal vents, or mini-volcanoes on the ocean floor, is actually independent of the sun, because the food-pyramid there is based on bacteria that live on the enriched water flowing from the vents. So an asteroid strike or mega-volcano that clouded the skies and stopped photosynthesis wouldn’t directly affect that underwater economy. But vents sometimes go extinct and Vulcanoctopus hydrothermalis must lead a precarious existence. I’d like to know more about the species, but it’s one interesting octopus among many. This book is an excellent introduction to this eight-limbed group and cousins like the ten-limbed squid and the sometimes ninety-limbed nautiluses. It will guide you through all aspects of their lives and behaviour, from chromatophores, detachable arms and jet propulsion to siphuncles, glue-glands and the hectocotylus, the “modified mating arm” of male cephalopods that was once thought to be a parasitic worm. That mystery has been solved, but lots more remain. 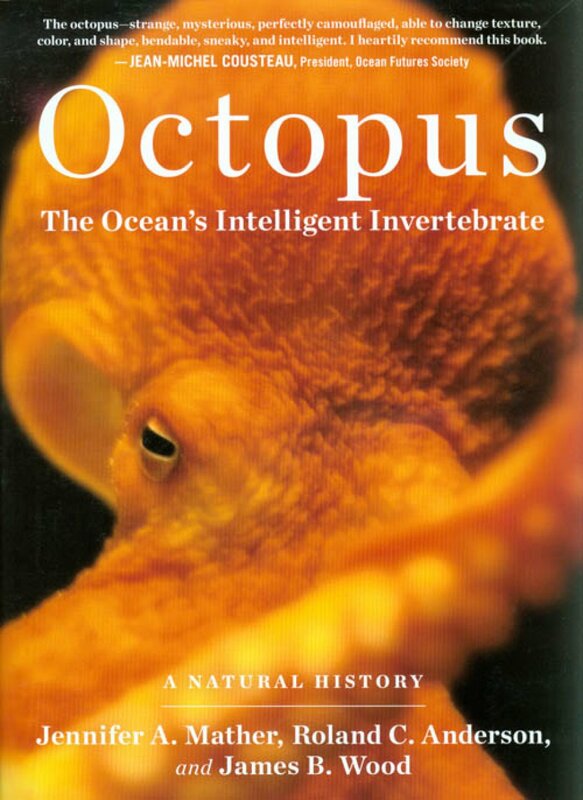 Octopus: The Ocean’s Intelligent Invertebrate should appeal to any thalassophile who shares the enthusiasm of H.P. Lovecraft or Arthur C. Clarke for a group that has evolved high intelligence without ever leaving the ocean.